Cutting width of mower: 48 in. Operator Comfort: Spacious operator deck has an uncluttered floorboard to give you ample legroom; Enjoy an adjustable, cushioned seat with sturdy, padded armrests and an attached seatbelt for your protection; Cup holder; User friendly instrument panel keeps essential controls and indicators, like the fuel gauge, close for easy viewing; Foldable ROPS to ensure operator safety. Choice of Kubota Engine: Durable Kubota Gasoline Engine - The Kubota gasoline engine delivers durability and productivity like no other. This reliable, air-cooled engine offers outstanding performance and quiet operation. 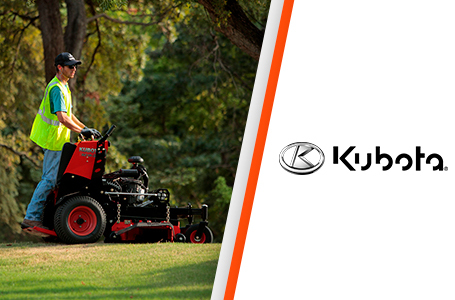 Specifically designed for mowing, it features Kubota's clean-flow structure, which virtually eliminates the likelihood of grass clippings clogging the wide cooling air passages. 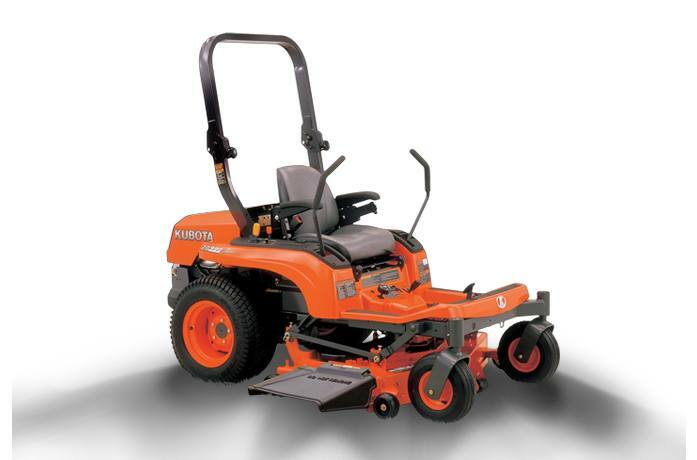 Kubota Diesel Engine - Known for their durability, high performance, energy efficiency and reliability. Their fuel efficiency, high torque, quiet operation and reduced emissions help you take on heavy mowing jobs for extended periods. High-Performance HST Transmission: For superior durability, the ZG Series features an integral-type, twin-hydrostatic transmission. Except for an occasional fluid change, its hermetically-sealed structure requires no maintenance or belts to change. Flexible Cover: The ZG200 Series employ a flexible-yet-sturdy discharge cover to help prevent damage to shrubs and landscaping. Pro Commercial Mower Deck*: Featuring a heavy-duty, Pro Commercial mower deck designed to maximize cutting performance. The 6" deep, double V-belt decks feature a unique baffling system that improves airflow to discharge grass clippings, and an anti-overflow system that reduces grass spillage and helps give lawns that well-manicured look. 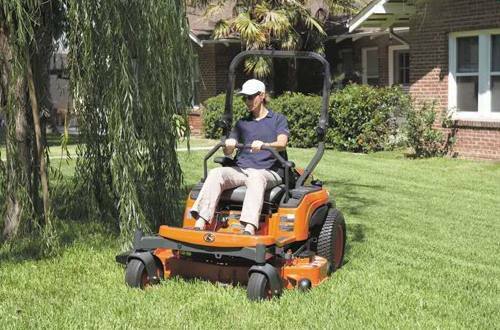 *Not available on ZG222A-4S - for an economical choice, the ZG222-48S is equipped with a 5"-deep stamped mower deck. Easy Maintenance: For routine maintenance like adding oil, simply lift the hood; Seat panel lifts up for easy access to the HST; Easy access to upper mower, mower belts and universal joint with a hatch built into the operator's platform; Optional maintenance lift. 0% A.P.R. for up to 36 Months on your new Z100 Series Mower! 1. Listed series installment credit program not available for Rental, National Accounts or Governmental Customers. For eligibility, customer must pay a percentage of sales price, fees, and taxes per the table below. Subject to amount financed. Only Kubota and Kubota performance-matched Allied equipment are eligible. Inclusion of ineligible equipment may result in a higher blended A.P.R. Stand Alone Kubota or Allied implements and attachments/accessories are subject to stand alone programs below. 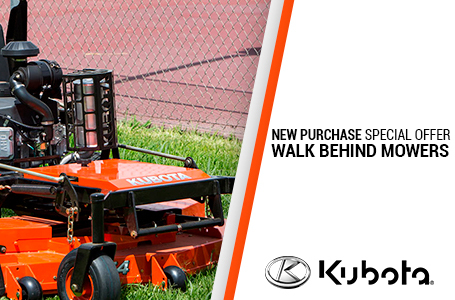 Financing is available through Kubota Credit Corporation, U.S.A.; subject to credit approval. Some exceptions apply. Offer expires 6/30/2019. 0% A.P.R. for up to 36 Months on your new Z400 Series Mower! 0% A.P.R. for up to 36 Months on your new Z700 Series Mower! 1. $0 down, 0% A.P.R. financing for up to 48 months with no payments for 6 months on purchases of select new Kubota Z700 equipment is available to qualified purchasers from participating dealers’ in-stock inventory through 3/31/19. Contract term begins from date of first payment. First payment due 6 months from contract date. Example: If purchase was made in January 2019 on a 48-month monthly installment repayment term at 0% A.P.R., it will require 48 payments of $20.83 per $1,000 financed beginning in July 2019. 3. Listed series installment credit program not available for Rental, National Accounts or Governmental Customers. For eligibility, customer must pay a percentage of sales price, fees, and taxes per the table below. Subject to amount financed. See Length of Repayment by Amount Financed chart below. Only Kubota and Kubota performance-matched Allied equipment are eligible. Inclusion of ineligible equipment may result in a higher blended A.P.R. Stand Alone Kubota or Allied implements and attachments/accessories are subject to stand alone programs below. 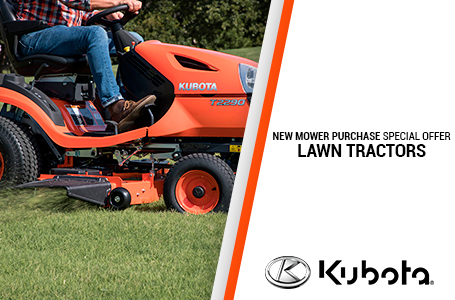 Financing is available through Kubota Credit Corporation, U.S.A.; subject to credit approval. Some exceptions apply. Offer expires 6/30/2019. 0% A.P.R. for up to 36 Months on your new ZD1000 Series Mower! 0% A.P.R. for up to 36 Months on your new ZD1200 Series Mower! 0% A.P.R. for up to 36 Months on your new ZD1500 Series Mower! 0% A.P.R. for up to 36 Months on your new ZG200 Series Mower! 0% A.P.R. for up to 36 Months on your new ZG300 Series Mower! 0% A.P.R. for up to 36 Months on your new ZP Series Mower! 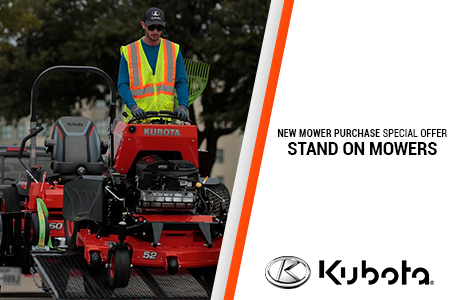 0% A.P.R, 0% down, financing for 48 months on purchases of new Z100 Models from participating dealers in-stock inventory is available to qualified purchasers through Kubota Credit Corporation USA; subject to credit approval. Example: 48 monthly payments of $20.83 per $1,000 financed. Example amount based on sales price of $3,969. Each dealer sets own price. Prices and payments may vary. Offer expires 6/30/19. This material is for descriptive purposes only. Kubota disclaims all representations and warranties, express or implied, or any liability from the use of this material. For complete warranty, safety and product information, consult your local Kubota dealer. 0% A.P.R. for up to 48 Months on your new Z100 Series Mower! 0% A.P.R. for up to 48 Months on your new Z400 Series Mower! 0% A.P.R. for up to 60 Months on your new Z700 Series Mower! 0% A.P.R. for up to 48 Months on your new ZD1000 Series Mower! 0% A.P.R. for up to 48 Months on your new ZD1200 Series Mower! 0% A.P.R. for up to 48 Months on your new ZD1500 Series Mower! 0% A.P.R. for up to 48 Months on your new ZG200 Series Mower! 0% A.P.R. 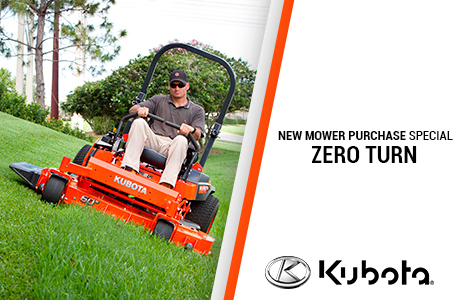 for up to 48 Months on your new ZG300 Series Mower! 0% A.P.R. for up to 48 Months on your new ZP Series Mower! 0% A.P.R. for up to 36 Months on your new T1880/T2080/T2380/T2090/T2290 Series Mower! 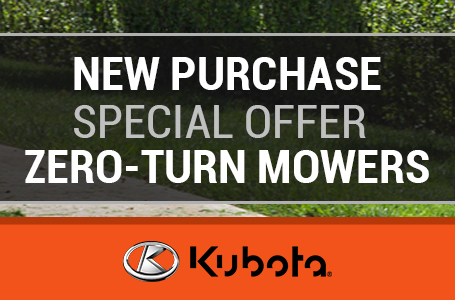 KUBOTA GR20 SERIES - NEW MOWER PURCHASE SPECIAL OFFERS 0% A.P.R. for up to 36 Months on your new GR2020/GR2120 Series Mower!